Are you confused about the differences between stock, broth, bouillon, and soup? If so, you're not alone. There's not much agreement, even among chefs. Some say stock and broth are the same. Some say the only difference is that broth has seasoning, which stock has none. Let's start by saying that broth and bouillon are synonymous and that if broth is served as a dish in itself, then it's soup (especially if other vegetables, meats, grains, and seasonings are added). That leaves us with stock versus broth. If you're a home cook wondering if you can substitute stock for broth in a recipe, there's really no major difference. Just watch the salt, because a product labeled "broth" may be seasoned whereas one labeled "stock" may not be seasoned. Read the label and be sure to taste-test before adding your own seasonings to your dish. If you're a classical French chef (or aspiring to be one) and using classic recipes, then there's a distinction between broth and stock that you should consider. Professional organizations such as the Culinary Institute of America and the French Culinary Institute believe that the distinction between broth and stock is the use of bones versus meat. A classic or traditional stock is made from bones plus a few vegetables (usually aromatic vegetables like onion, carrots, and celery) with no seasoning. The bones may be roasted for additional flavor. 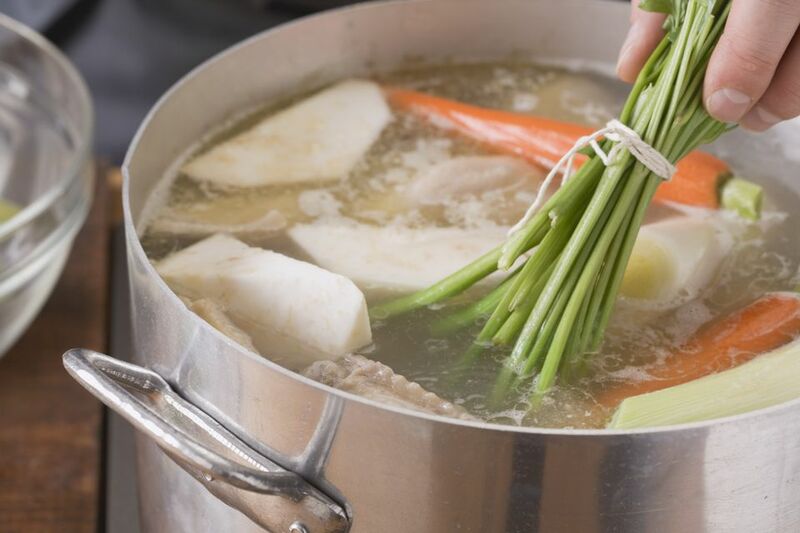 When cooking stock, the aim is to get the collagen from the connective tissues, which makes a stock thick, and even gelatinous when cool. The body that the collagen gives to stock is its defining characteristic. A stock is not thought of as a finished product but as a base for other things such as sauces and soup. A traditional broth, on the other hand, is the liquid in which meat has been cooked. It has basically the same vegetables as stock, but it is usually seasoned. A broth may be served as-is, in which case it is then officially a soup. Consommé is an example. One way of looking at it is that stocks stay in the kitchen but broths may go to the table. When it comes to vegetarian varieties, "vegetable stock" is exactly the same as "vegetable broth" since vegetables have no bones. Practically, in many kitchens, there may be little disparity. Stocks or broths may be seasoned or unseasoned, bones with meat still attached may be used to make either. Again, for the home cook, what it boils down to is that stock, broth, and bouillon are interchangeable. They're the foundation of soups, sauces, and many other tasty dishes. Have fun making your own homemade variations and experiment with store-bought brands. Once you've found your personal favorites, you won't need to focus on their differences—all you'll need to do is cook!